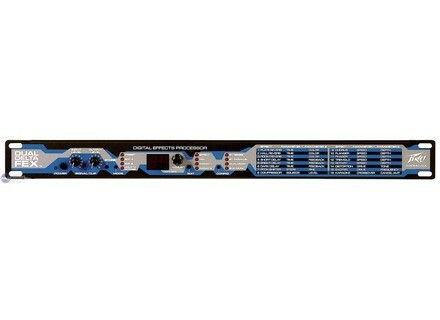 Dual Deltafex, Multi-Effects Processor from Peavey. • Intuitive interface for storage and recall presets edition. • 16 types of effects including reverbs, delays, modulation, distortion, karaoke, etc..
See the manual here ( http://catalogs.infocommiq.com/AVCat/images/documents/pdfs/Dual%20DeltaFex_Owners%20Manual.pdf ) . It is an evolution of Deltafex, so when it was first used, the Dual poses little problem, although it is more complete. Note that the Dual Deltafex can serve as a preamp (between the instrument and the amp) or effects loop (on an amp or a table). According to the site attributed to him, some effects are not as important (a distortion in the loop, it is not pretty). I like the transparency of Peavey, which preserves the color of the sound of my equipment. Anyone who wants the chorus or delay Roland Boss not find them! He who wants to enhance his own sound should find his account. First used in the studio, I found a well known auction site. Its original price average € 250, it is found to OCCAZ 'between 100 and 150 €. The product is fairly rare in Europe. This is an informed choice before buying that meets my needs me. I like the look and feel of this unit.